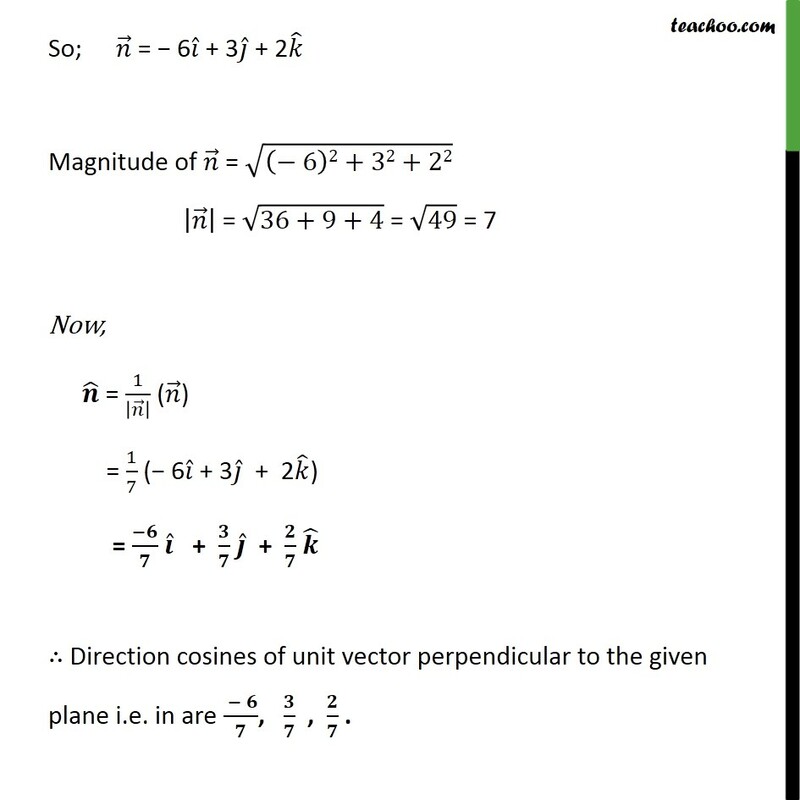 Example 14 Find the direction cosines of the unit vector perpendicular to the plane . (6 3 2 ) + 1 = 0 passing through the origin. Vector equation of a plane at a distance d from the origin and unit vector to normal from origin is . = d Unit vector of = = 1 ( ) Given, equation of plane is . (6 3 2 ) + 1 = 0 . (6 3 2 ) = 1 Multiplying with 1 on both sides, . (6 3 2 ) = 1 1 . ( 6 + 3 + 2 ) = 1 So; = 6 + 3 + 2 Magnitude of = 6 2+32+22 = 36+9+4 = 49 = 7 Now, = 1 ( ) = 1 7 ( 6 + 3 + 2 ) = + + Direction cosines of unit vector perpendicular to the given plane i.e. in are , , .